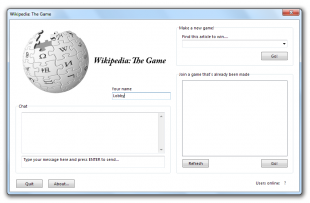 Wikipedia: The Game is a real time multiplayer game where the goal is to find a specific wikipedia article. This is the best game in the world. Easy installation, fits on a floppy! A user hosts a game by typing or choosing a preset article name. When another user joins the game and is ready, the game begins. Everyone starts at a random page, where the search box and other helpful links are removed, so you can only click on the links inside the article texts. The goal is now to reach the page that was chosen by navigating through Wikipedia articles, finding articles within the same category as the chosen article. The first one who manages to find the article wins! The game requires you to be able to find articles relating to the chosen article, eventually finding the article.